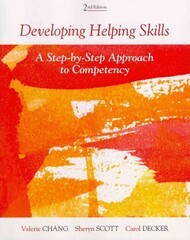 Developing Helping Skills 2 Edition Whether you are preparing for social work, psychology, counseling, marriage and family therapy, pastoral counseling, human services, or a related helping profession, this unique book offers the fundamental knowledge and skills sets you need. The authors' multilayered learning system integrates reading, discussion, observation and visualization, practice, and evaluation. Self-assessment, critical thinking, and practice play a central role in the book's presentation as the text prepares professionals in training for generalist practice with individuals, families, and groups, including entire communities and organizations. You begin by reading the text and completing the homework exercises that follow each new concept. You then view the accompanying DVD (available for purchase) to see how to apply the skills in practice effectively. The text's case-based approach helps you think like a professional with a continuing case that is introduced one section at a time. Finally, role playing in practice interviews and completing evaluation tools allow you to assess progress and determine your personal readiness to apply your skills within actual life settings.